If it's location you're looking for, then look no further than these attractive, air-conditioned apartments. This beachside property makes an ideal base for exploring the sights and sounds of san Antonio Bay. Nice location, but that's all,...its almost on the beach. There is no catering of any kind, not even a drinks machine. Meals if booked have to be taken at another hotel, the Riviera, which is a few minutes walk away. No Bar, No Snack Bar, no facilities for children. We were given a room with broken air conditioning, but on the second day we asked to move and we were given a much nicer room with working air conditioning plus a sea view. Definitely not a place for families or older holidaymakers. OK if you want to party at night and sleep during the day. Would only return if we knew for certain that it had been refurnished and repaired. We have just got back from this resort and we found it very friendly & clean a really good location just a stones throw from the beach everything you need is very near ie: bars resturants! The apartments are very clean and so is the surrounding areas ie: the pool and sun loungers. We enjoyed are stay here and would definitly go again. To start off with this hotel was like a shody bedsit in birmigham one of the worse ones at that.The staf was most unhelpfull but english was good i suppose,the rooms was clean thank goodness.our 1st day there it rained but only for about 3 hours and it was styl warm enough to get a tan!.The hotel entertainment was absaloutle awfull we asked for hotel entertainment which we did not get,we had to leave our hotel and go to the opposite one "play bella apartments" to have sum kind of entertainment evnt this was only sum nights and in there the food was discusting and well overpriced,there was no room to event move in here, as you can immagine with guests from two differant Hotels,my youngest daughter age 2 at the time was exreamly bored of a night with not many other children there.However there was a parrot show on one night inside the hotel which was fantastic.The pool was okay and my older boy and girl age 11 & 14 at the time enjoyed it.The bars and clubs are not so stict on age limits as my son age 14 was able to get into clubs and bars and drink!.I would not recomend this hotel for children or familys who look for nightly entertainment. 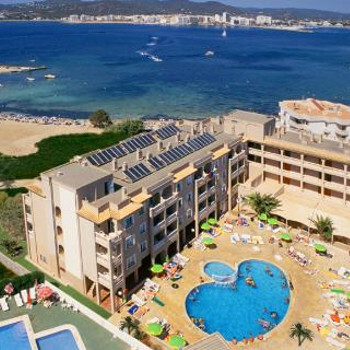 The Calas De Ibiza was advertised as a family friendly hotel, whilst we were there all three children with us had had accidents in one way or another. There were also quite a number of older lads and girls. The apartments were kept very clean but unfortunately we found the pool area disgusting. There was rubbish left all over the place and the pool and around the pool smelt really bad. I did not find this hotel family friendly at all, although the staff in the bar were more than helpful on many occasions. The hotel we stayed in was wonderful the staff were polite kind and helpful. The hotel was clean was spotless the maid was in everyday new sheets on every Wednesday. In the hotel there was 2 single beds and a campbed witch you all so had to sit on a tv table with 4 chairs cooker toaster. The location was wonderful a viewing of the beach small but lovly always could find sunbeds and sunbeds with parasol. The trips were hippy market, boat cruising, aqua park and scuba diving. Entertainment was ok but nothing on only on several days of the week. The beach was a bit rocky in the sea there fish in the sea. There were lots of kiddies parks with trampolines, mini bungi, rodeo bull, bouncy castles, funslides lots and lots. So in my opinon I would go backk to this hotel it was marvellous!!!!! I did not find the apartments family friendly at all. More than half the complex was occupied by "young & lively", who were very rowdy to say the least!! The air conditioning did not work for the whole of our 2 weeks stay and the bathroom ceiling leaked water through it. All in all a disappointing holiday and I would not recommend these apartments to families. The pool was a bit grotty and its water was like sea water the play area was a bit dangerous, and only reason why I want to go there again is because the staff were friendly and helpful. Our apartment was lovley to sleep in and the air conditioner was fabulous. The hotel was spotless, and you could see your face in the floor! the cleaners were there everyday. Hotel pool, staff and apartments and location were fantastic. We had a good laugh with the staff , and nicknamed a few characters! The music half way thro we changed ourselves BEP(I like) but we got fed up with!! Location was opposite the small but nice beach, although it was pebbly in the water. We went on a self catering holiday. Apartment very very clean. It could not be faulted. Breakfast in hotel lovely. Location good as its near the beach. Staff very friendly. No entertainment as such, music in bar repetitive - alright for any Black Eyed Peas fans! I would visit this hotel again. Had a laugh, which is what counts. Loved the Hotel, it's right on the beach and a few shops and bars. I'm 19 and went with my mom, thought it would be loud for her but it turned out to be too quiet, most nights we travelled to San Antonio by the water ferry, quick and easy although gettin there from the hotel was a bit of a task. Hotel was very clean, the staff were lovely and friendly and we ate in the hotel bar most of the time, great food. Can't fault the hotel in any way, just it's location as it's a bit far from any good bars. Going back again next yeah with my mom for another girly holiday, I can't wait!